The trick: With this clamping device the customary clamping head is replaced by a segmented clamping bushing. In principle it performs the same tasks as a clamping head. The difference is the possibility of realizing large clamping ranges of multiple millimeters. Simultaneously the radial clamping force can be specifi cally changed by changing the taper angle. 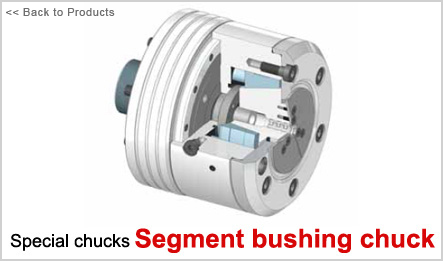 Our experts match the chuck precisely to your requirements. Regardless if you need extremely high holding power for friction welding, or simply want to overlap a work piece by several millimeters when clamping. At HAINBUCH you will always fi nd an individual solution that further optimizes your manufacturing process.